Millions of Americans were in the path of a major storm on Sunday that caused flash flooding and devastation throughout the middle of the country, The Weather Channel's Chris Warren reports. Violent storms that left at least 16 people dead in Oklahoma and Missouri were heading towards the Northeast and Mid-Atlantic Sunday, as the nation’s mid-section struggled to cope with floodwaters. At least 13 people –including nine adults, three of who were storm chasers, and four children — were killed after five tornadoes — one a half-mile wide — struck the Oklahoma City area Friday evening, terrorizing communities already battered by deadly storms this spring. The Oklahoma City Fire Department on Sunday was also searching the Oklahoma River for four more missing people. Hospitals in Oklahoma City reported 115 injuries, according to the Oklahoma State Department of Health. One of the dead was named by the Oklahoma County Sheriff's Office as James C. Talbert, 65, whose vehicle drove off a washed-out bridge in eastern Oklahoma County Saturday. Three further deaths, in Missouri, were blamed on flooding caused by the torrential hailstorms that the weather system brought to large parts of the mid-US. "Authorities have confirmed three deaths from high water; those occurred in Lawrence, Miller and Reynolds counties," said a statement from Missouri governor Jay Nixon’s office. The Weather Channel confirmed at least three tornadoes touched down around St. Louis, badly damaging homes but not causing any fatalities. Tens of thousands were without power, and only eight minor injuries were reported. Gov. Nixon declared a state of emergency. After touring the damage on Saturday, Nixon told The Weather Channel that "dozens of houses literally exploded" in Charles County, where an EF3 twister ripped through. 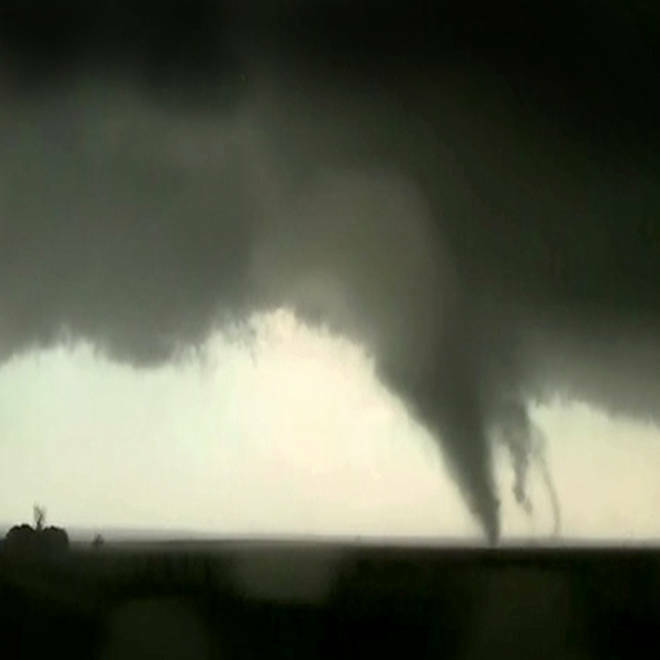 Three "storm chasers" who had done work with The Weather Channel were killed in Friday's tornadoes. Father and son team Tim and Paul Samaras, as well as chase partner Carl Young, were killed as a result of a twister in El Reno, Okla.
"They went in the field focused on collecting data to enable meteorologists to further the science behind tornadoes which we know has and will help to save countless lives," The Weather Channel said in a statement. "Our community has suffered a terrible loss and our thoughts and prayers are with their loved ones." About 30 miles from Oklahoma City, there is now rubble and heartbreak in the aftermath of a destructive storm. NBC's Mark Potter reports. "The last two nights, I've been having hell," Roy Stoddard, a truck driver from Depew, Okla., who was delayed by rising floodwaters at Little Rock, Ark. on Thursday told The Associated Press. On Friday evening, he had to take shelter in a store's walk-in cooler during Friday evening's rush-hour in Oklahoma City as deadly weather approached. "I know what a tornado can do," Stoddard added. The weather system had started lurching eastward Sunday, bringing scattered thunderstorms, some severe, to the Northeast and Mid-Atlantic, the Weather Channel’s Michael Palmer said. Washington, D.C., was being hammered by showers and thunderstorms Sunday evening, which could go on until Monday morning, according to NBC Washington. In Anderson County in upstate South Carolina citizens told authorities of possibly tornado sightings, according to County Administrator Rusty Burns. Burns said at least one hit was struck and had its roof torn up, but there were no reported injuries Sunday evening. "Everything is under control now," Burns said. There is also yet more bad news for the Plains: The chance of yet more severe storms returns Monday, Palmer said. M. Alex Johnson, Janet Shamlian and Aaron Marmelstein of NBC News, and Mike Bettes of The Weather Channel, contributed to this report. Click to view scenes from Friday's violent storm.